Rabbits bite off my pea vines; deer jump the fence to chomp the Swiss chard; black voles lay waste in the bean hills; beetles swarm the cucumbers. But no critter touches the kale. Dense rows of blue-green kale thrive in bad soil, dry weather and stand pest-free. While I pamper, water, weed and feed every other plant in my garden, the kale soldiers on with gusto and gets no attention at all. Kale is hearty, cheap and good for us, but often we don’t know what to do with it: young, tender kale is nice in salads; mature kale can be boiled, braised or stir-fried, and, even though it’s one of the most nutritious green vegetables we can find, it has never quite had the cachet of snow peas, asparagus or even green beans. With a major row now across my garden, I’m intent on bumping up my vegetable calcium and making this a super kale summer. The Spanish potato and egg tortilla is one of the most delicious cheap foods on the planet. A few spuds, a bit of onion, a couple of eggs and some olive oil come together in a terrific tapa. 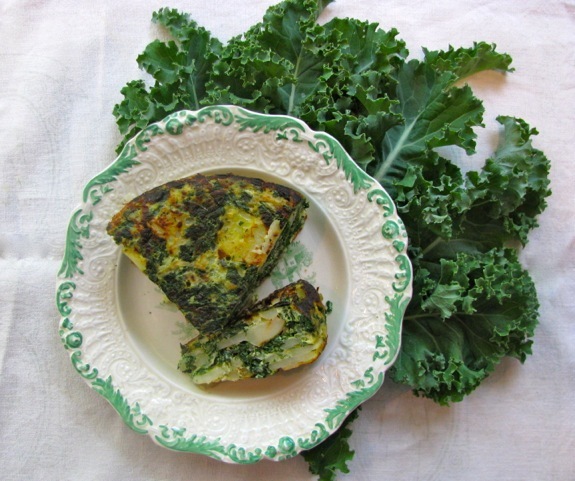 Add some wilted chopped kale and you have a great summer supper, picnic food, snack food or brunch idea and it’s almost free. Swirl 2 tablespoons oil in an 8-inch cast iron or no-stick heavy frying pan. Gently sauté onion, garlic, potato and optional chili with salt (loosely covered) until potato and onion are tender but not brown. Meanwhile bring 2 quarts salted water to the boil; strip green leafy part from the kale stems. Discard tough stems and cook green kale in boiling water for 2-3 minutes or until fork-tender. Pour kale into a colander, drain water, and as soon as kale is cool enough to handle, squeeze away water and chop coarsely. You should have a generous cup of chopped kale. Beat eggs in mixing bowl, add hot tender potatoes and onion, stir in chopped kale, and salt. Rub out any debris left in the skillet with paper towel and heat 2 teaspoons oil in the still hot skillet. Pour in the egg mixture, flatten evenly, shake pan and cook over moderate heat for 10 minutes. Shake pan from time to time to prevent sticking. Once the tortilla is 2/3 cooked, cover with a plate and upend the skillet so the tortilla drops out. (If a little sticks on the bottom of the pan, scoop it up with a spatula and place it on top of the potato cake.) Re-wipe the pan and film with 2-3 teaspoons more oil. Heat and slide the cake back in the skillet with the uncooked top on the bottom of the skillet. Shake and cook for another 5 minutes. Loosen edges with a palate knife; shake pan to insure tortilla is loose and again upend the fully cooked cake onto a plate. Cool slightly and serve warm, room temperature or cold. Makes 4-6 wedges. A bowl of leftover grilled fish and a bunch of kale in the fridge, a bag of rice on the shelf. Need a quick weeknight dinner? Kedgeree’s got your back. As far back as the 14th century, this basic rice and bean dish was a common staple across southern India; Arab traders took it throughout the Middle East. From the beginning it was quick, cheap and satisfying. 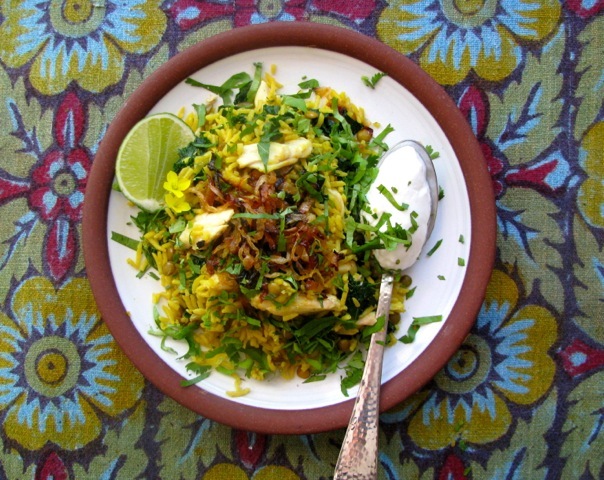 British officers from colonial regiments and East India merchants brought the curry-scented rice, Kitchiri, home to England, where it morphed into Kedgeree with the addition of smoked fish, parsley and cream. During the era of lavish Victorian country-house dining, Kedgeree was a popular breakfast item, but now, though still on the scene, it’s served for lunch, supper or picnic fare. In your bag of kitchen skills, it’s always good to have a rice dish you can pull together at a moment’s notice. All you need on hand is an onion, oil, rice, a few seasonings and some lentils. Leftover fish or canned fish, cooked chicken, assorted veg and herbs invite improvisations. Soak lentils for 1 hour or parboil 5 minutes and drain. In a heavy saucepan with lid melt half the butter in 1 tablespoon oil; heat and quickly fry thinly sliced onion until crisply golden. Remove to a small dish and reserve for garnish. Melt the second half-tablespoon butter in remaining oil and sauté the cinnamon stick and cardamoms and chopped onion until translucent. Add garlic, ginger, chili and sauté until fragrant. Add turmeric, curry powder, rice, and sauté until rice is coated and sizzling. Stir in lentils; add salt and stock. Stir, cover and bring to a boil. Reduce heat and cook for 10 minutes. Turn off heat, top rice with kale (or spinach) and fish (or other leftovers). Return cover and rest for 10 minutes. At this point rice and lentils should be tender and the toppings hot. Fluff rice with fork, mixing in fish and kale. Spoon up servings, garnish with reserved fried onion, chopped cilantro or mint and lime. Serve with plain yogurt. Makes enough for 4. Remember to try it at room temp or just out of the fridge, or pack it along for a picnic. My dad had callused hands, cracked heels and a temper that could split stone. He rose early, knew the hours without looking at the clock and clung to the land. He defined himself by his work whether it was selling cars, picking raspberries or pruning peach trees, and travel made him eager to get home. His voice rose with “ Holy, Holy, Holy” at First Presbyterian, and I didn’t know whether to relax or tremble in his presence. When he cooked breakfast for everyone, he opened a hidden door to a generous side, and his blue eyes twinkled. His specialty was a homespun version of Welsh rarebit served on hot homemade biscuits with fruit, jam or bacon. Most people don’t think of the “cheese on toast” idea as something for breakfast, but it is indeed delicious and serves as a simple supper equally well. While his tender drop biscuits were in the oven, Dad melted a hefty amount of grated cheddar in milk and stirred in a couple of beaten eggs just before serving. I’m refining the process here by thickening the milk first with a little cornstarch to guard the melting cheddar against curdling, which really isn’t a problem outside of appearance. If I don’t have biscuits on hand, some good whole grain toast will suffice. Rather than breakfast, I’d choose this cheese dish for supper or a starter with a dab of chutney or salsa. Now that I live far from the apricot tree out the back door, a side green salad will complete the plate. Father’s Day beckons us to remember; I’m thankful my dad cooked. Bring milk to simmer in a small saucepan. Season with pinch salt, pepper and optional dash of cayenne and/or mustard powder. Liquify cornstarch with a teaspoon of cold water and stir into scalded milk. Simmer stirring until milk thickens to the consistency of heavy cream. Add grated cheese and stir with wooden spoon until cheese melts. At this point the milk and cheese will look thin. Blend three spoonfuls of the hot cheese into the beaten egg; pour the tempered egg back into the cheese in the saucepan and continue to stir with wooden spoon in a figure-eight pattern. Cook, stirring gently over low heat until the spoon leaves a dry path on the bottom of the pan and the cheese has thickened to a soft, dolloping sauce. Spoon cheese onto split, hot biscuits or over crisp, buttered toast. Serve with a dab of spicy tomato chutney or salsa and a green salad. Makes a light first course for 3-4 or supper for 1. 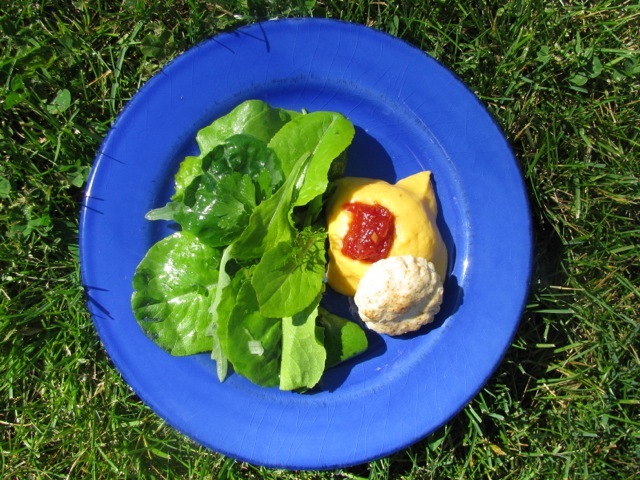 You are currently browsing the Mary Jo's Kitchen blog archives for June, 2012.